Grand prize winner Urbana 5th grader Jackson DeWitt, lower left, works on his Fiesta Salad Surprise assisted by food service worker Melissa Branch, while third place winner 4th grader Peyton Longstreath discusses her Arroz con Carne with Urbana Mayor Bill Bean and Sodexo Food Service General Manager Shelly Hall supervises fourth place winner 5th grader Lily Wilson as she prepares Mexican Casserole. From left are last year’s grand champion 6th grader Nathan Jones, Urbana Mayor Bill Bean, 4th grader Peyton Longstreath, 4th grader Lexi Kerns, 5th grader Jackson DeWitt, 4th grader Kaitlynn Folden, 5th grader Lily Wilson and Caring Kitchen Executive Director Marilyn Cohn. 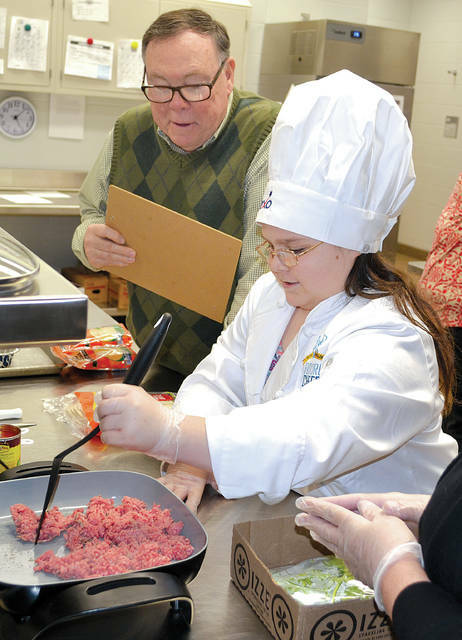 Urbana Mayor Bill Bean talks to 4th grader Kaitlynn Folden as she prepares Beef Enchiladas for the Future Chefs competition. 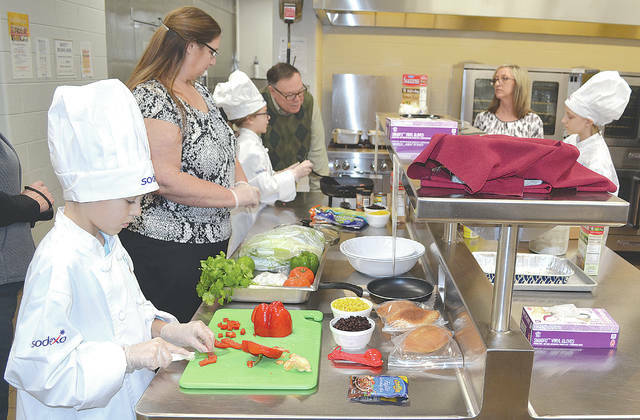 Urbana 5th grader Jackson DeWitt won the Future Chefs challenge in the Urbana PK-8 cafeteria on Thursday with his Fiesta Salad Surprise recipe. This year’s theme was Fiesta Fit. Students were encouraged to submit a family or created Mexican-style recipe for consideration. There were five finalists. The second place finalist was 4th grader Lexi Kerns with Tex-Mex Chicken and Rice with Bolillo Roll, third place was 4th grader Peyton Longstreath with Arroz con Carne, fourth place was 5th grader Lily Wilson with Mexican Casserole, and fifth place was 4th grader Kaitlynn Folden with Beef Enchiladas. The judges were last year’s grand champion, 6th grader Nathan Jones, Urbana Mayor Bill Bean and Caring Kitchen Executive Director Marilyn Cohn. 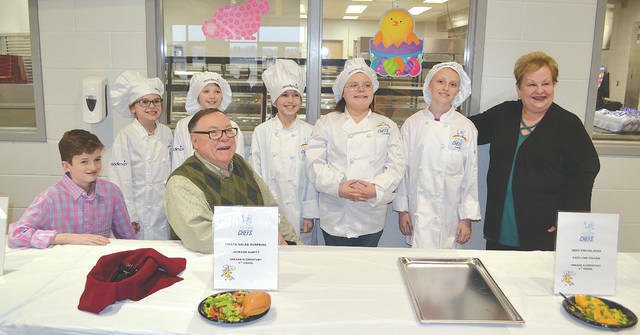 Finalists were selected by an anonymous judge, and all contestants were assisted in preparing their meals by school food service workers. The meals were then judged according to healthy attributes, kid appeal, ease of preparation, originality, plate presentation and taste. According to Shelly Hall, general manager for Sodexo Food Service, this contest was established to bring awareness to childhood obesity and to promote healthy eating habits. The grand prize for this competition was a set of pots and pans and an opportunity to participate in the regional competition later this year. All finalists were allowed to keep the chef uniform and hat used for the competition.